This week is "Beaujolais Nouveau" week, with its release this Thusrday, November 19th; followed by "Thanksgiving" the next week on Thursday, November 26th. Two great occasions to fill up your cellar with Gamay and Cabernet Franc based wines. Soon to come Christmas and New Year's eve will be greater occasions but I will suggest you different wines and festive sparkling gems. However, Beaujolais and Gamay are in the spotlight this week, so let's talk about them. Led by firmly established brands, (somewhat too commercial for my liking: i.e. George Duboeuf, Louis Jadot, Labouré-Roi and Drouhin), Beaujolais Nouveau invades the US and the rest of the world market, each year on the 3rd Thursday of the month of November. It triggers excitement and excess of craziness, always a good excuse to party and celebrate, and usually disturbs (or even disfigures) the decor of your local wine boutique for at least 3-4 weeks, occupying the front shelves and the easy-to-find "displays" next to the registers (up until the end of the year). It is usually an easy sale which requires no special skills but a simple sentence: "Nice, fruity, simple and juicy, and this year it bursts "Banana" (or strawberry) flavors"(by the way, IMO, Duboeuf this year seems to be a mix of both....try it, you'll see). The other good thing about Beaujolais Nouveau is that it gathers people and usually untied their tongues which inevitably lead to empty, never-ending conversations about the subject for a few days. It used to be a great tradition up until a few years, but, gradually, over the last 2-3 years Beaujolais Nouveau has been overlooked for better wines and more interesting values, probably due to an over excessive dose of battering propaganda, mass marketing and more often lack of quality. The phenomenon may still work in restaurants by the glass, but people have slowly abandoned the idea of buying Beaujolais Nouveau in wine stores to replace it with (or simply continue to buy) better wines at better value, or even straight Beaujolais Villages that are usually far better and more complex for about the same price or just a bit more. What also happen is that people buy a bottle of Duboeuf for fun and also buy a bottle of a different producer like Dupeuble or Domaine de La Madone (by Jean Bererd et Fils) which are a bit more expensive, to compare them, the later being often the winner. However, what I saw over the last few years are constant decreases of sales resulting in left over stocks of Beaujolais Nouveau bottles up until March of the next year. Every retailer will tell you that the turn over is not good enough. More over, most retailers usually end up by reducing the price of the last remaining bottles in January just to get rid of them. Even this year, we decide to go with only three producers and to only order 5 cases of each max (10-15 for the best seller, no name...) just to avoid having some left over in January (who wants to sell Beaujolais Nouveau in January?...so imagine March!). People who know me well or/and follow this blog, knows that I'm very open minded and I try to keep my palate has open as possible to everything from everywhere without having any prejudices or try to discriminate a wine because of its color, its grape variety, its region of origin or its taste, because I believe that, as I always say, "Every wine should be tasted, even if every wine shouldn't be drunk!" In short, I like Beaujolais and even a few of the Beaujolais Nouveau, but I think there are better Gamay wines out there, if you really want to experience Beaujolais wines. That is why I decided to come with a list of alternative wines also made with Gamay and a few made with Cabernet Franc and other lesser known grape varieties to complement your Thanksgiving dinner and for you to enjoy through out the end of this year. The Domaine Michel Cheveau was created in the 1950s by André Cheveau and is now operated by his son, Michel, and his grandson, Nicolas. The family home and the cellars are situated in the heart of the village of Pouilly. A total of thirteen hectares of vineyards are owned and cultivated by the Cheveau family with the holdings spread out over a variety of villages and climats. The vineyards are worked without fertilizers and the harvest is done manually. After a gentle passage through a pneumatic press, the fermentation occurs in temperature-controlled conditions. The elevage is done either in stainless steel or in small and mid-size oak barrels, depending on the appellation and structure of the wine. Domaine Michel Cheveau makes balanced, fresh, focus and juicy wines from Macon-Chaintré & Fuissé, Saint-Veran, Beaujolais villages and Beaujolais cru Saint Amour. Cheveau “Or Rouge” is a light yet generous, easy-drinking Gamay made from old vines. A Beaujolais Villages with great structure and length, it is fresh, smooth and fruity, ready to be popped and poured as an accompaniment to a variety of meats, pastas and cheeses. The Granger family has been involved in the production of grapes and the making of wine from father to son for over 200 years. Originally from the village of Chenas, for the last century the Grangers have lived and worked in Julienas. Pascal Granger, born in 1961, is now the owner and winemaker and guiding spirit behind the Domaine. He mainly produces Julienas where he possesses about 8 hectares, plus a small amount of Chenas, Moulin a Vent and Beaujolais Villages. After a careful selection from his best parcels of vines, he separates the wine destined to be the "Grande Reserve" from the cuvee designated "Cuvee Speciale". These special wines are usually aged longer in barrel, the Grande Reserve remains in small oak barrels for two years prior to being bottled without filtration. The Chateau is nestled in the small village of Lancie, located south east of Fleurie and Chiroubles, in the northern part of the Beaujolais appellation where some of the best soils and terroirs lay on gentle slopes of the rolling hills of the land of the "Crus". 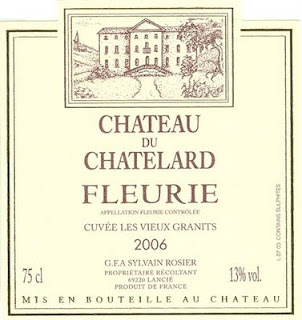 Chateau du Chatelard has a long established wine reputation and history. The Chateau, rebuilt in the XVIIIth century after being destroyed during the French Revolution, now belongs to Sylvain and Isabelle Rosier. This young couple is passionate about wine and terroir, making beautifully crafted Beaujolais with old vines, some were planted around 1955, under sustainable and Biodynamic culture: no herbicide, respect of the biological life of the soil, short pruning on accordance to the moon, working the soil, leaving the grass and maximum foliage completed by selected hand harvest at full maturity, to obtain the best, healthy grapes. The resulting wines are great, balanced, fruity and gentle, yet rich and complex without being too opulent. 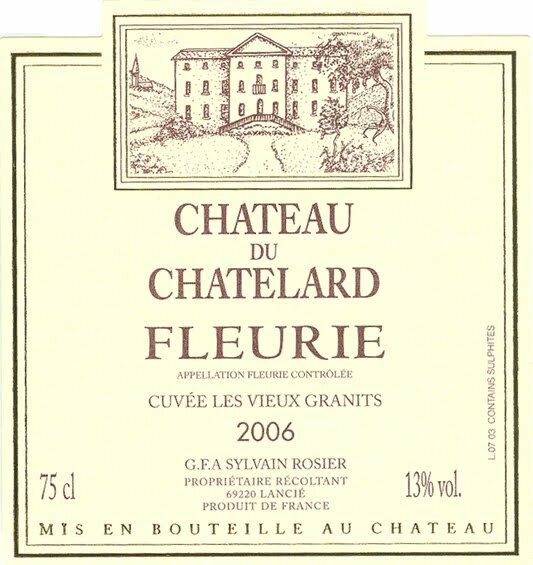 The well-crafted 2006 Chatelard Fleurie Vieux Granits possesses lovely purity of fruit, with raspberry and blackberry flavors. The palate is quite rich, fruity and expressive with a velvety texture and a long finish carried by ripe acidity that lets the fruit and spice notes hang on. Joseph Chamonard was part of a group of friends, amongst some of the best Beaujolais’ producers, including Marcel Lapierre, Guy Breton, Jean-Paul Thévenet, Jean Foillard, and their mentor late Jules Chauvet. Joseph Chamonard died in 1990, and his daughter Geneviève, helped by her husband Jean-Claude Chanudet, continued making supple and fruit forward Beaujolais wine in the same old traditional way, walking in the steps of her father with combined Biodynamic-organic methods and respect for the natural environment. Recently imported by Savio Soares in New York, Chamonard’s wines were barely distributed outside of the local market and were apparently difficult to find even in Paris. Now available in New York, Chamonard’s wines feature on the selection of some of the most established wine boutiques and restaurants. 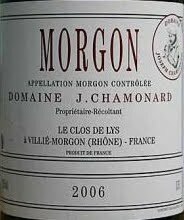 The 2007 vintage is a classic in Beaujolais, and this Chamonard Morgon reveals the high quality of the vintage topped with an attractive Terroir driven attitude. The nose is very fragrant, with straightforward aromas of light cherry and raspberry, and earthy notes. Light to medium in body, the wine is perfectly balanced between full fruit and lively acidity, with a light touch of yeast on the finish. The Tijou family has a long history as "viticulteurs" in the Loire Valley region near Angers. In fact, they have practiced their craft, father to son, since 1780. Pierre-Yves Tijou, the current proprietor, took over the management of the estate in 1969 and began to bottle a portion of the production. Today, the entire production is estate-bottled. More well-known for their Chaume and Savennieres, the Domaine encompasses about 30 hectares of vineyards in highly regarded vineyards such as “Chaume” and “Clos des Perriers” of which 18 hectares are planted with Chenin Blanc to produce their flagship wines from the seclusive “Coteaux du Layon” and “Savennieres” area; and 7 hectares Cabernet Sauvignon and Cabernet Franc; and there are small parcels of Sauvignon Blanc, Chardonnay and Gamay. Treatments in the vineyards are kept to an absolute minimum as the objective is to produce a wine in as natural a manner as possible. All grapes are harvested manually as the “vendanges a la main” on the label means. 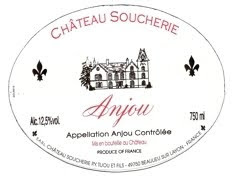 Made from 100% Cabernet Franc, the 2008 Chateau Soucherie Anjou is a small production, racy red, with black currant and red cherry fruit flavors intermingled with slight toasted notes. Pretty balance and dry with bright red berries in the palate and good tannic structure. Overall this wine is quite good with a brambly finish showing hints of tobacco leaf and spice. (FYI: Soucherie label as Changed and is slightly different than the one above). 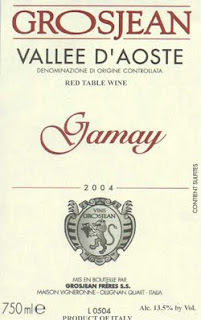 2008 Grosjean Frères Gamay Vallee d'Aosta is a great wine with lot of focus and brightness. Passed its light, bright transparent, red-ruby-pinkish-red onionskin color, the nose offers vivid mineral, light red cherry and floral notes intermingled with earth and smoke. The palate has an excellent balance with broad, quite deep red fruit flavors, well-integrated tannic structure and a racy, lifting acidity nicely carrying the fruit. The finish is quite dry yet juicy and refreshing with dry red cherry, flowers and more mineral and earth. Overall, even if not your everyday wine, this high altitude Gamay is really good with a beautiful, very broad smooth mouth-feel full of freshness. Serve it with simple dish like pasta, cold cuts and soups, or even fish. 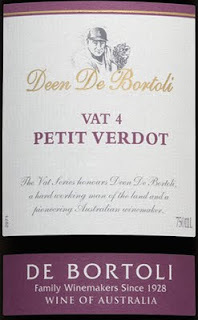 The inspiration for the Vat Series came from the early days when Deen de Bortoli would personally chalk numbers on vats to mark them out. Vat is the term for the large vessels, usually made of oak and bigger than the barrels, still use in a lot of wine regions by many producers, to hold the maturing wine before it is ready for bottling. Petit Verdot is a grape originally from France, more precisely Bordeaux where it is normally part of the blend in small quantity. 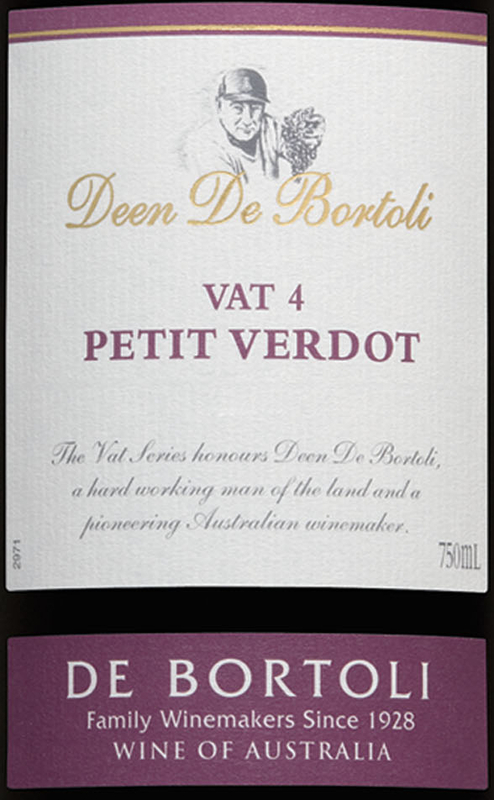 However, in Australia Petit Verdot thrives in sunny climate and due to a longer ripening season, it is more often bottled on its own. This wine exhibits aromas of violets, concentrated plum and blackberry with spicy notes. On the palate, this Petit Verdot is a delightful wine with medium to full intensity and generous fruit without being heavy or too opulent. Balanced , rich and supple, well rounded yet with good acidity, it exposes sweet vanillin and spicy oak character mixed with darker fruits as the result of the 12 months ageing in American oak barrels before bottling. Pair it with quail, veal and smoke meats. Established in 1964, by the way one of the best vintages of the 20th century in France and Spain, Bodegas Heredad de Baroja, located in the village of Elvillar, Rioja Álava (South of the Basque country), was born from the initiative of its current owner, Fernando Meruelo, who named it after a famous Spanish Basque writer. He started by producing young wines (tinto) under the name of “Cautivo” and gradually enhanced his “Cautivo”selection by crafting Crianza, Reserva and Grand Reserva as the vines were getting older, thus producing better, richer, more complex wines. Exporting activities started in 1989 and now represents more than 50% of his production and total sales. The construction of a new winery, the success of his newer style wines “Cautum” and “Lar de Paula” and revamping the image of his more traditional style “Cautivo” wines led to a new era for Heredad de Baroja. His wines, especially the newer modern style received instantaneously a lot of praises and accolades from critics and press. Now equipped with state of the art technology in both facilities, the old and the new cellars, will also help to achieve the goal of making about 2 million bottles a year, of which half will be high-end wines ageing between 14 to 36 months depending on the final wines. Rincon de Baroja is part of his fairly new wine selection that includes: Cautum "Alta Expresión", Lar de Paula "Cepas Viejas", Rincon de Baroja CO2, Cautivo Maceración Carbónica. 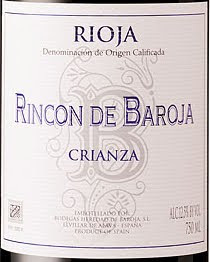 The 2005 Rincon de Baroja Crianza is is a delicious Tempranillo based wine that offers ample dark fruit quality in an inexpensive package. Aged twelve months in French and American oak, its nose offers soft cherry and vanilla aromas. Smooth and full in the mouth, its rich fruity flavors are supported by fine tannins into an elegant, lingering cedar cherry finish. Enjoy with beef burgers, steaks, lamb and other hearty meats. 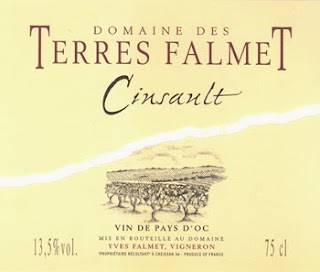 Domaine des Terres Falmet was established in 1996, in the little village of Cebazan, located southeast of Saint-Chinian (north of Narbonne and west of Beziers). The Domaine encompasses 25 hectares of contiguous vineyard plots planted on hillside with excellent sun exposure. The young and talented Yves Falmet, owner and winemaker, produces this well crafted Cinsault from vines that are more than 50 years old planted on very rocky, clay-limestone soil, so the resulting wine combines, character, length and depth with juicy fruit, mineral and good tannic structure. Moreover, with no filtration or no fining, this wine didn't lose any of its personality or varietal character. Within the next few days, I will add a few more red and white wines that I just bought for the store and that will be perfect for the Winter season. I'll keep you posted soon!